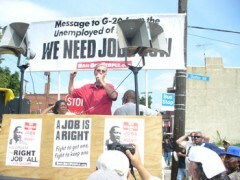 G-20 protest in Pittsburgh: March for Jobs | Fight Back! 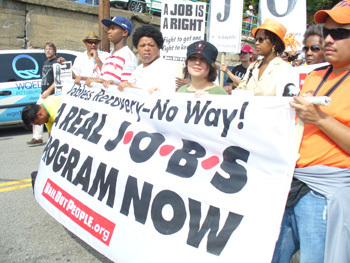 Lead Banner in September 20 March for Jobs in Pittsburgh. Pittsburgh, PA - A powerful march for jobs filled the streets here, Sept. 20, in the first major protest before the G-20 summit. Organizers estimate more than 1000 people joined the demonstration, which marched from the Hill district, the historic center of the city’s African American community, to Freedom Corner. Organized the Bail Out the People Movement, speakers at the rally included Pam Africa, International Concerned Family and Friends of Mumia Abu-Jamal; Nellie Bailey, Harlem Tenants Council; Mick Kelly, Minnesota Coalition for a People’s Bailout; Oscar Hernandez, participant in the 11-month Stella D’Oro bakery strike in New York City; Sandra Hines, Michigan Moratorium NOW! Coalition to Stop Foreclosures and Evictions; Larry Holmes, Bail Out the People Movement; Fred Redmond, vice-president of the United Steelworkers; Lynne Stewart, civil rights attorney and others. Speaking to the rally, Rosemary Williams, who has waged an heroic battle to keep her foreclosed home, urged all those in attendance to attend the Oct. 3 “We Say Fight Back!” Conference in Chicago.